The majority of the upper unit is comprised of Open Mesh, which offers breathable and comfortable coverage as noted by some runners. The synthetic overlays improve the fit, while the no-sew construction allows the inner to be like a sock-like fit based on several runners’ comments. Runners generally appreciated the inclusion of a traditional sock liner for some added cushioning. A natural underfoot feel is given by the Fresh Foam mid-sole compound, which is a single-piece foam. Blown rubber on the outsole provides traction and durability for the external layer of the Fresh Foam Boracay. There were runners who noticed the outsole wear off easily after a few months of use. Some felt that it wasn’t true to its size because they felt that it was smaller than their usual choice. Others felt that the toe box was a bit narrow. The Fresh Foam Boracay from New Balance is a running shoe that has a lot of followers because of the incredible comfort, responsive cushioning, and sufficient arch support. It offers an adequate underfoot platform that follows the natural geometry of the foot, which makes it a very good daily trainer. I came across the Nike Air Pegasus 33. 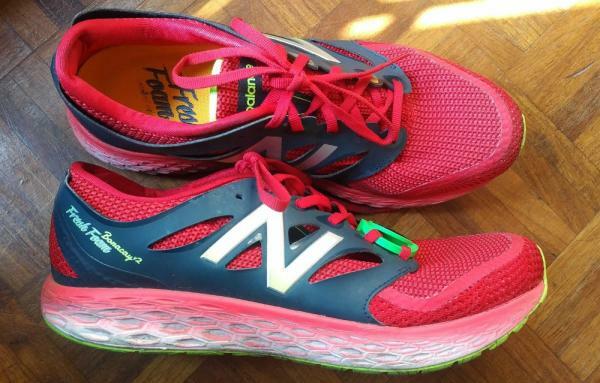 In fact, I was so convinced by the Boracay V2 that 3 weeks before my ultra-marathon (87km), I changed my mind and swapped out my Nikes for the New Balance. Will this be something I would live to love or regret? The upper outer layer flares at the ankles; it looks as though material cut does not fit. The laces are “ribbon like” and too long; they need to be double knotted to reduce the length and to stay fastened. I had some foot slide with the left shoe, despite running in thick trail socks. The Boracay V2 is a half size bigger than my other shoe brands. Tongue padding is too thin and sometimes causes a double fold. The wide and comfortable toe box. During heel strike, it offers adequate shock absorption. Has a nice snappy kick-off. Outsole wear and grip is good. The outsole looks thick enough to endure a long life of pavement punishment. The rubber material elasticity and density are enough that the road surface tension is softened for a great ride. The hexagon pattern sole is flat and offers grip that is very good but not tacky. Wear to the outsole after 180km is insignificant, a contradicting fact considering how pliable the rubber feels. The fresh foam does an adequate job at shock absorption at the heel strike. Not as cushioned when I compare this to my Nike Pegasus 33. The forefoot is surefooted and kickoff has a rolling feel of the contour of the midsole, even when going uphill. The lightness of the Boracay V2 really helps when climbing hills too. I do feel a little disengaged from the ground under my foot by the density of the fresh foam. I like to feel a little more surface texture under my foot when running, this just adds to the diversity of the terrain and I feel this takes away some of that experience. The fresh foam could be a little softer at the hill, but at the forefoot it is perfect. At the forefoot, if you bend the shoe by hand you will notice how much springiness and snap the shoe has to come to rest. Nice materials used inside and out. The seamless joining of the toe box and upper with which looks like a length of tape is impressive. The upper does not feel restrictive or tight, the toe box is comfortable and spacious. The heel counter does not have any structured inserts or supports at the Achilles collar. Putting on the shoe can be a struggle as the Achilles collar collapses and folds under the hill of your foot. As mentioned material flares at the side of the heel and looks as though fitment is too big and not form fitting. The upper when running gives you a sense that there is nothing covering your foot. The lightness of the Boracay V2 added with a good forefoot role and unrestrictive upper, are the standout points for me. It has a snappy kick-off, due to the fresh foam rigidity and memory. There are no clever inserts in the midsole like Nike Pegasus 33 has the zoom air unit, it comes as is; that is what the ride feels like. Foot on a slice of foam, yet comfortable foam at that. Despite the comfortable mid-sole, I still feel that the Boracay v2 can do with a dual foam cushioning. Softer at the heel and fresh foam to the front; this is my biased opinion since I have been spoiled by running in my Nike Pegasus 33. If I have known no different, I would say it's adequate cushioning. If I could sum up the New Balance Fresh Foam Boracay V2, I would say, it makes a perfect hill day shoe! An everyday runner with snap and has got the will to push you faster with comfortable cushioning. I also really enjoy running in these shoes on the treadmill, due to the softer outsole; no clanky noise and nice cushioning. The Boracay V2 has now become my dedicated treadmill shoe; it has outclassed its predecessor the Adidas Ultra Boost. It has better stability and is a faster shoe for treadmill speed work. Coming back to my Ultra Marathon (Comrades, 87km), this turned out to be a 10 hour day, 1 hour longer than planned. My ITBS flared up quite early into the ultramarathon, this could have something to do with the shoes… I can only keep speculating. But where the New Balance Borocay v2 gets accolades, is that after training in my Pegasus 33 for 6 months, it managed to convince me that it was a better runner. Whatever you wanna do, I think this is a shoe that's gonna be able to do it. You can still expect a lightweight, cushioned ride from the Fresh Foam Boracay. A very smooth, decently responsive, well cushioned daily trainer that is light enough at just over 9 oz to be in contention as my 2015 marathon shoe. The New Balance Fresh Foam Boracay features the innovative single-piece Fresh Foam midsole that brings the standard midsole to the next level. It delivers durable cushioning and soft underfoot feel. The Fresh Foam Boracay is available in standard shoe length. It gives snug fit on the heel, midfoot and forefoot. This shoe is available in standard, wide and extra wide widths. It gives comfortable fit to those with regular and wide foot measurements. The outsole unit uses the full ground contact rubber that gives added durability and reasonable traction. The elongated hexagon lugs gives added grip and flexibility. The Fresh Foam Boracay uses the Fresh Foam midsole that has geometric shape to provide added support. This midsole provides durable, soft underfoot cushioning also to the NB Boracay 3. The New Balance Fresh Foam Boracay features the open mesh cover that gives lightweight breathability. The synthetic overlays deliver a secure fit by wrapping the foot snugly. The traditional sock liner delivers added underfoot cushioning.